Non-auto renew - you'll make a one-time payment via online banking, credit card or debit card. After that, you'll have to make one-time payment to renew your plan every 30 days. During your service, you can still change from non-auto renew to auto renew. Do this via the ookyo app > HQ > Payment > turn 'on' automatic renewal. You'll need to provide a credit/debit card to set it up. If the charge was unsuccessful, your ookyo plan will turn to Grace. You can do a one-time payment to reactivate your service. 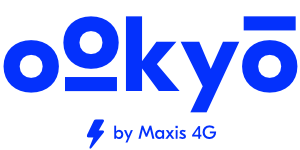 via the ookyo app > HQ > click on 'Make grace period payment' > redirected to Maxis Pay to complete payment. Grace period lasts for 50 days. If you do not reactivate your plan within the 50 days Grace period, your service will terminate. Any ookyo credit, Google Play Rewards, services, and your number will be forfeited.